Cassy Tully – Fine Art and HSHS St. Nicholas Hospital are excited to announce that Ella Bindl, a fifth-grade student at St. John the Baptist Catholic School in Plymouth, has been chosen as the Grand Prize Winner of the 125th Anniversary Art Contest. Premier sponsor was the ACUITY Charitable Foundation. The contest was open to all area fifth-grade students, and resulted in several hundred entries. From that body of artwork, the judges selected Ella as the Grand Prize Winner – her artwork, along with the Top 25 Winners’ artwork, was professionally framed, and will be displayed at the Fall “Health, Healing & Hope” Art Show at HSHS St. Nicholas Hospital. An all-school assembly was held in St. John the Baptist’s gym on Wednesday, May 27th. HSHS St. Nicholas Hospital president Andy Bagnall presented Ella with the Grand Prize award, along with her masterpiece, which was professionally framed by Cassy Tully – Fine Art. “We are here to celebrate the thought and creativity that Ella put into this drawing, and the importance that art plays in healing,” Bagnall said to the students. Ella’s grandparents and parents attended the presentation; afterward, her mother, Kelly, shared the family’s excitement. “She has always been an art lover, always drawing and reading, and we’re so very proud of her,” Kelly said. Additionally, 125 entries were also selected to be shown at the hospital’s 125th Anniversary Celebration on August 4th. They will then be donated to the hospital to benefit healing patients. To celebrate the 125th Anniversary of HSHS St. Nicholas Hospital in Sheboygan, Cassy has been commissioned to create an original painting and commemorative prints. Her 24” X 36” masterpiece will capture the spirit of the first St. Nicholas Hospital on Superior Avenue in Sheboygan. 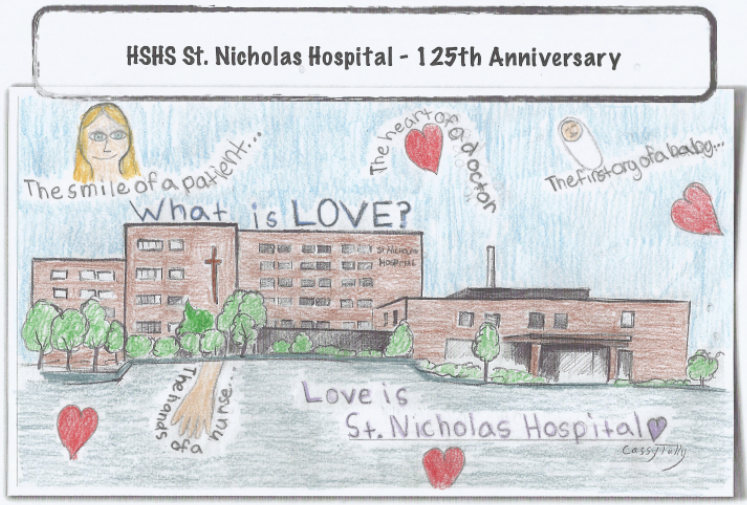 HSHS St. Nicholas Hospital will celebrate their 125th Anniversary with a mass, community picnic and health fair on August 4, 2015. To learn more, please visit http://www.stnicholas125.org. For additional information, please email info@cassytully.com. This entry was posted in Uncategorized on July 16, 2015 by Frank Juarez.